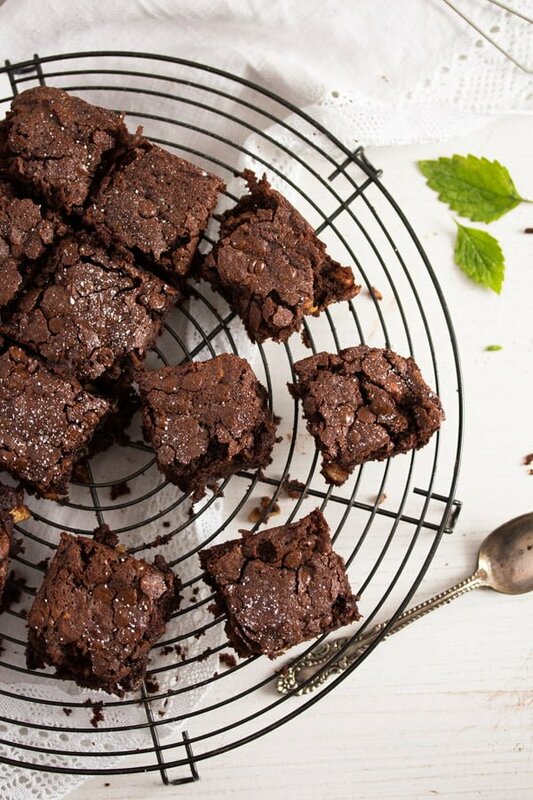 Delicious zucchini brownies made with chocolate and full of cashew nuts and chocolate chips, these are the perfect summer brownies. I made these last week and I chose the recipe just because it contained zucchini and I still have so many zucchini in my cellar waiting to be cooked. Same in 2018 when I made and photographed these Zucchini Brownies with Cashew Nuts and Chocolate again. Way too many zucchini every summer, although I don’t grow any vegetables myself. But there are plenty of friends or neighbors who do have their own vegetable patch and everybody always seems to plant too many zucchini plants in spring. I don’t know why, they all actually know that 4 or 6 zucchini plants are too much for a normal family, if all the plants actually reach maturity and the summer is good, you will have enough produce out of 6 plants to feed half a village (OK, our village is really small…). I am not that much into chocolate, but I do love brownies. I make some quite often, they are easy to make and I can also be sure that everybody will like them. And I do enjoy adding a bit of a surprise ingredient from time to time, like the zucchini in this case or the black beans in these Black Bean Brownies. The recipe only needs 150 g zucchini, it is not the world, but still something and these brownies really could not be better. 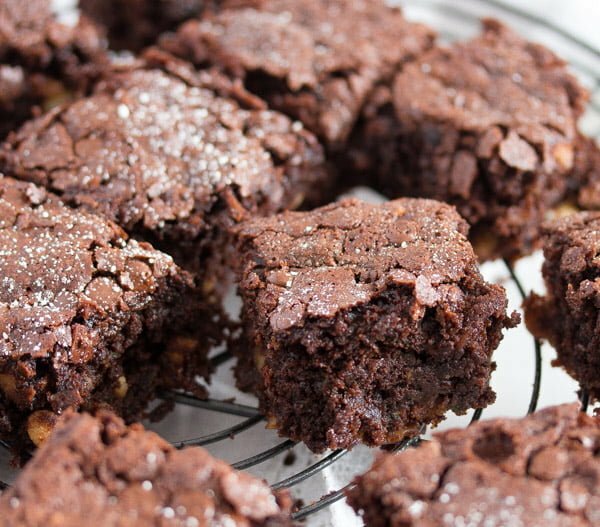 I mean, brownies, everybody loves them, there are so many recipes out there and they are probably all good, but if you, like me, swim in zucchini at the moment, do give these brownies a try, you will not regret it. This is a simple brownie recipe made both with chocolate and cocoa. 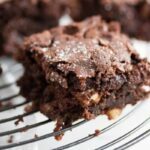 I can assure you that using both chocolate and cocoa will make these brownies unbelievably chocolatey, a chocolate’s lover dream come true. And another brownie recipe full of chocolate, even more chocolate than in the case of the zucchini brownies: Cherry Brownies. I promise you will not taste or see the zucchini at all, they are there to make the brownies so wonderfully moist. They will also make the brownies more delicate than regular fudgier brownies, these zucchini brownies are more cake-like, but with a moist interior. Start by melting the butter and the chocolate. Chop the chocolate finely and regularly, this will help it melt quicker. Very important is to not let the mixture get too hot or come to a boil. If it does threaten to get too hot, remove the pot from the heat source and continue melting the butter and the chocolate off the heat. Stir often. Let the mixture cool until you prepare the rest. Grate the zucchini and squeeze them in your hand to remove the extra moisture. I recommend weighing the zucchini before grating and squeezing them, and not measure the grated zucchini in cups. A cup measurement is really not reliable in this case, depending on how much you press the zucchini in the cup, the results would be too different. Chop the cashew nuts roughly. Whisk the eggs, sugar and vanilla. Mix the flour, cocoa and baking powder together and sift them over the mixture. Fold in. Fold in the zucchini, cashews and half of the chocolate chips as well. Chocolate chips are optional, you can leave them out, if you wish. Sprinkle the brownie batter with the remaining chocolate chips and bake in the preheated oven. Check after about 30 minutes, the toothpick inserted in the middle of the cake should still have chocolate traces on it, the brownies should not become dry in the middle, but remain nice and moist. If there is too much chocolate on the toothpick you can bake the brownies for a few minutes more. Leave the cake get cool in the pan. Serve sprinkled with some icing sugar, if you wish. Preheat the oven to 170 degrees Celsius/ 340 degrees Fahrenheit. Line a brownie pan (mine is 20x20 cm/ 8x8 inches) with baking paper. Give the butter and the roughly chopped chocolate to a small saucepan and heat gently until melted. Do not let boil. Leave to cool for a few minutes while preparing the rest. Grate the zucchini and squeeze them in your hand to remove the extra moisture. Roughly chop the cashews. Give the eggs, sugar and vanilla sugar to a bowl and whisk with a hand-held mixer until frothy. Mix the flour, cocoa and baking powder together and give over the egg mixture. Incorporate and add the butter-chocolate mixture. Fold in the zucchini, cashew nuts and half of the chocolate chips. Pour this mixture into the prepared pan and sprinkle with the remaining chocolate chips. Bake for 30 to 35 minutes, depending on your oven and also the size of the pan. Insert a toothpick in the middle of the cake. It should come out still a little moist. Leave to cool in the pan, take it out and dust with icing sugar if desired. The zucchini brownies keep well in an airtight container for several days. 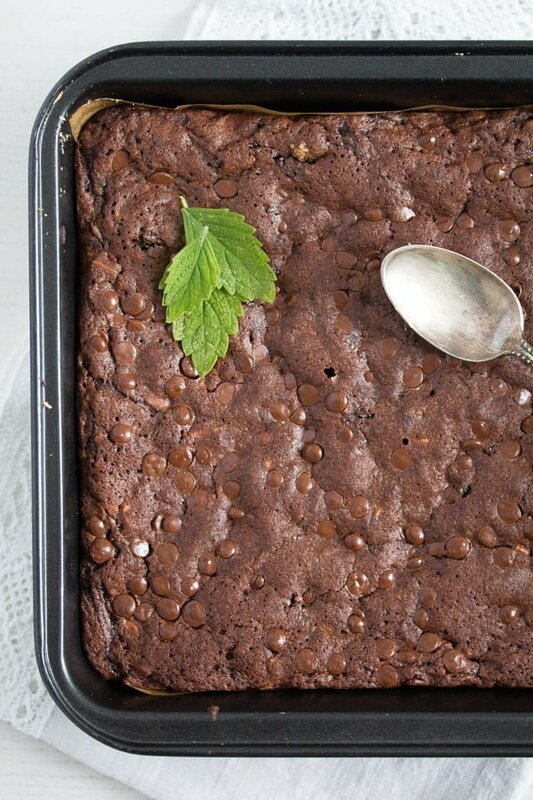 I have yet to try Zucchini Brownies and I have no clue what I have been waiting for! I LOVE your addition of cashews to the mix! I bet that provides some seriously delicious crunch! 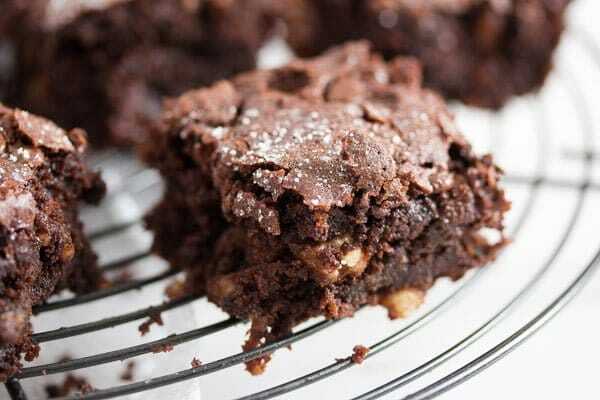 I’m going to have to hop on the zucchini brownie train and give these a try! Thanks for sharing the YUM!! Cheers! Thank you, Cheyanne. 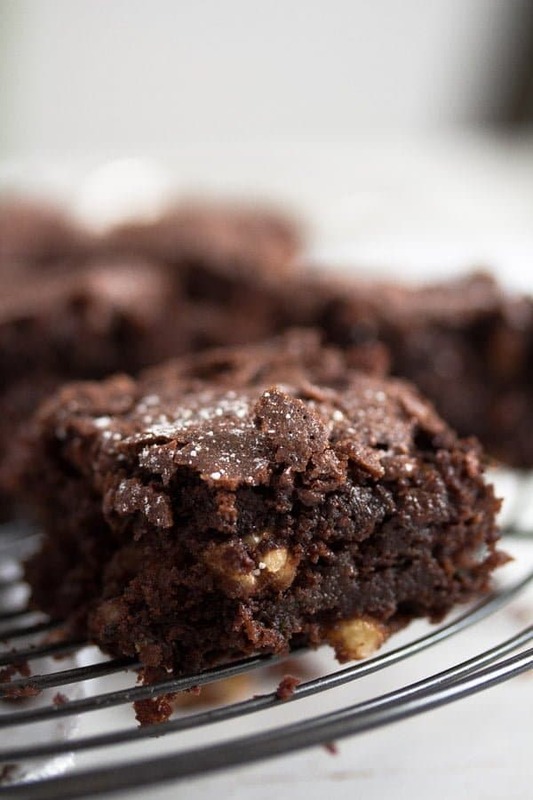 You will not even know there are vegetables in the brownies, they make things only nice and moist and the cashews do add some crunchiness. I hope you give them a try. Love this twist on the classic brownie!! 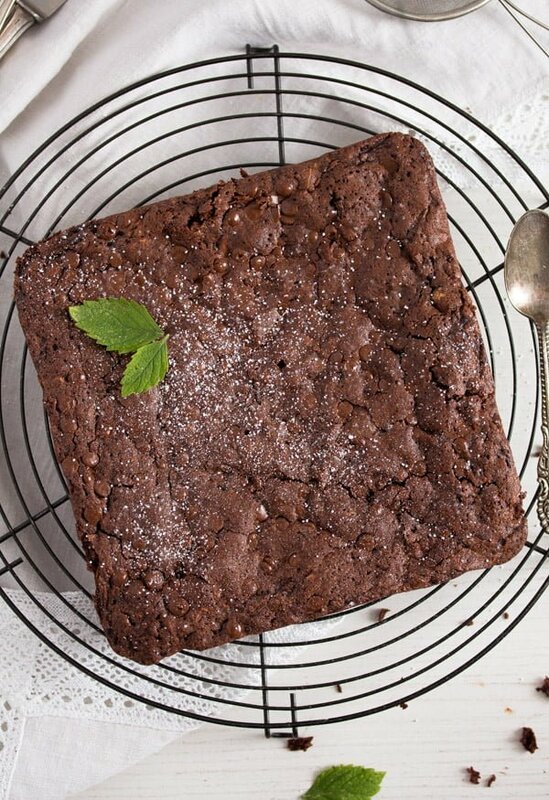 I have used zucchini in my baked goods but have not tried it with brownies. This looks insanely good! Saving this in my TK recipe box! Thank you, Thao. Zucchini are great in cakes, they make things so nice and moist. I had a lot of zucchini and came across this recipe. It was so good I made it 3 times last week. Thank you!